Scandinavian style has been present since the early 1930s and it is here to stay, mainly because of its functionality, simplicity and minimalist look. This style is all about incorporating natural and modern elements for the purpose of creating a space that embraces effortlessness and defies clutter. When it comes to colours, the Scandinavian colour palette is soft and reserved with lots of neutral shades that can amplify the effect of natural light, making your home bright, shiny and tidy looking. The first and most important piece of the puzzle is Scandinavian modern furniture. According to interior designers, trying to incorporate as many as possible wooden Scandinavian modern furniture pieces is one of the best ways to bring the outdoors in which is what the whole Nordic style idea relies on. Pine, maple, oak and teak are the main types of wood that can really show off the natural wood grain and they, in fact, are considered the main types of woods used for designing Scandinavian furniture. Dining chairs, coffee tables, dining tables, side tables, wooden sofa legs, chair construction and legs are some of the most important types of Scandinavian furniture pieces where wood is everything. In light of that, make sure you choose these pieces wisely as they have the power to make or break the space. 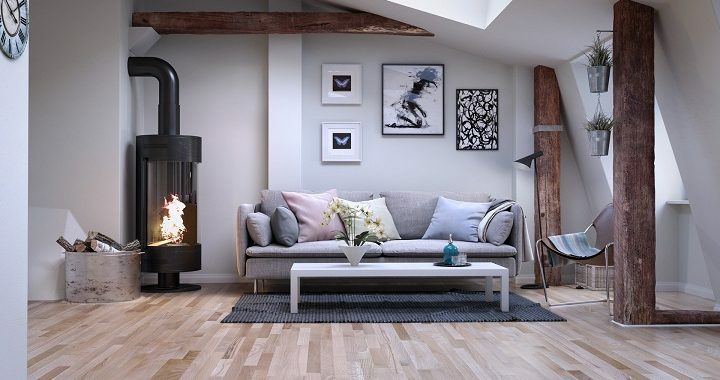 Another thing you should keep in mind is that there are some other types of furniture materials like a range of metals (iron in particular) that can be considered as a part of the Nordic style to a certain extend, but wood has to dominate the scene. Another essential piece you need to implement in your home to complete the whole Scandinavian look is faux fur. According to interior designers, using faux fur is the perfect way to make your home warmer and cozier. Whether used as an area rug or a material for a throw pillow, faux fur is a great way to add warmth into the clean and minimalist Nordic environment. Modern art pieces, on the other hand, are ideal for breaking up the walls’ dullness. For instance, you can add some modern art prints and photography in black and white as to inject some life into the otherwise blank lifeless walls. Except for these, you can also opt for monochromatic pieces and ink drawings, however, adding some colour like baby pink and copper is also an option. Just make sure you choose an artwork piece that matches the room’s accent colour.